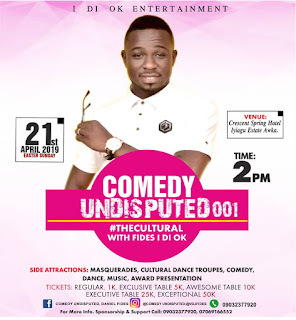 Comedy Undisputed 001 #TheCultural with Fides I DI OK. is set to hold down on the 21st of April at crescent Spring Hotel Iyiagu estate, Awka. Just like the name is, it's a comedy show the first of its kind to be hosted in the City of Awka the Capital city of Anambra State Nigeria. The Event is being Planned and Hosted by the I DI OK Entertainment a subsidiary of Great Ambassadors Entertainment and it's being Championed by The CEO of the above mentioned Company Daniel Fides Popularly Known as Fides I DI OK. It's an event which its Target audience is the General Public no age Limit. The event according to Fides Will now be an annual Event that will take place every Easter Sunday. It's all about Comedy, Music, Dance and off cause Culture. Miss This I bet you will Miss Slot.